On Friday, over 1,000 teachers in Kentucky called in sick in response to a provision changing their pension benefits that was tacked on last second to a sewage bill. The gumption to protest has spread; on Monday in Oklahoma, teachers are poised to walk out of the classroom over school spending cuts. The Oklahoma Education Association, the state’s largest teacher union, is calling for $10,000 raises over three years, $5,000 raises for bus drivers, custodians and other staff, and restoration of tens of millions of dollars in education funding trimmed in recent years. 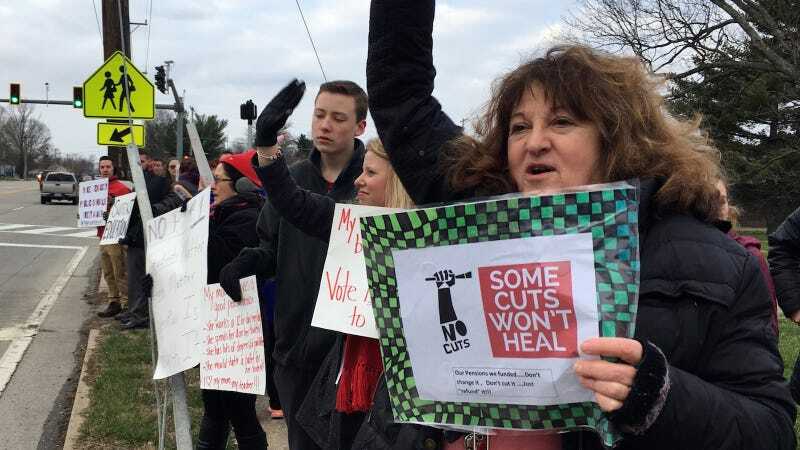 The union is following in the footsteps of the moderately successful strike in West Virginia for a living wage raise, buoyed by a wave of dissatisfaction around the country from educators, who are largely women. The Guardian reports that teachers in Arizona, New Jersey, Pennsylvania are also all considering actions in protest of their working conditions, galvanized by the public show of support for West Virginia’s teachers on social media.